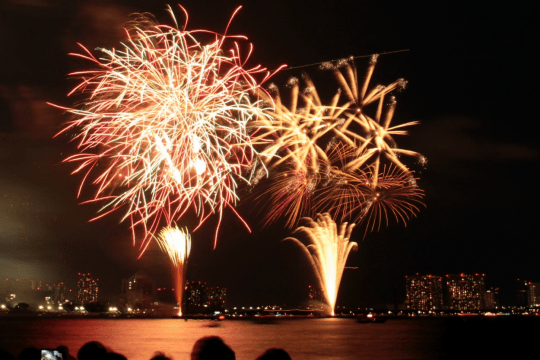 For centuries, ever since gunpowder was discovered by the Chinese, man has been fascinated by fireworks. In the 21st century it seems that almost any celebration is an excuse to let off fireworks. Anything can be used as an excuse to celebrate with fireworks such as Independence day in the US, New Years celebrations, bonfire night in the UK, birthdays, anniversaries, the list goes on. I get that people enjoy loud bangs and sparkly things. however, what about our canine (and other animal) companions? Are they having such a great time with the explosions and flashing skies? Well, some dogs don’t seem to mind too much and seem unaffected by the interruption to there daily life brought by the whizz bangs. Others react by barking at the noise and flashing lights. The group that concerns me, and there are many, are the ones that are, clearly, petrified of the noise and flashes outside their home. These shrink away to a place where they hope they may be safe and become shivering wrecks of their former selfs. The effect of the fireworks is terrifying and crippling for them. But, you know, it’s only a few times during the year, they’ll get over it. Dog owners need to be aware of this and to do something about it. These petrified pups need our help. I could ramble on about desensitising your dog to these frightening things. However, if your dog is suffering badly you would be better advised to talk to a behaviourist and your vet. These dogs may need the intervention of sedatives to help them. I will concentrate, rather, on some of the general things you may do to help a dog who is frightened of fireworks. Exercise — make sure you exercise your dog with a good walk and a play session before any fireworks are scheduled. It can be easier to settle a dog who is tired and relaxed after a good bout of exercise. Comfort — make sure you close windows and curtains before the fireworks are scheduled to start. Many dogs have favoured places for sleep and rest. Ensure this area is prepared for the dog with their favourite bedding and toys for instance. Calmness — make sure that you display a calmness to your dog. Your dog will be looking for clues from you that things will be fine. Resist the temptation to try to reassure your dog with extra attention. Any concerns exhibited by you will only serve to reinforce the fear felt by your dog. You must ignore fearful behaviour; the worst thing you can do is respond to it — this will only serve to confirm to your dog that he is right to feel as he does. A helping paw — dogs often learn from other dogs. So, if you have a friend with a dog that is not fearful of fireworks and one that your dog knows, ask them to bring their dog around so your dog can see their calm dog in the face of the terror of the fireworks. Bach flower remedies — these are homeopathic elements that can be very effective. I have direct experience of using these with one of my rescued dogs a few years back. This guy would become petrified, a quivering wreck — this would last for as long as the fireworks were happening and for quite some times after they had stopped. Rescue remedy — a solution containing Star of Bethlehem, Rock Rose — particularly effective for fearful responses, cherry Plum, Impatiens and Clematis. Rock Rose — to supplement the rescue remedy. The way to use the remedies are to put a few drops on the dogs lips and paws a few hours before any fireworks are expected and then repeat every couple of hours during an evening. You may be surprised by the effect. Certainly using the rescue remedies in association with some of my earlier suggestion, my petrified friend would settle down and sleep through the fireworks going on around him outside. Using remedies with humans sometimes elicits the observation that they have only a placebo effect. I don’t think this can be said of dogs, after all, they have no idea what they are being given. By taking some of the steps described above, you may be able to make fireworks less of a trauma for your dogs. Good luck.